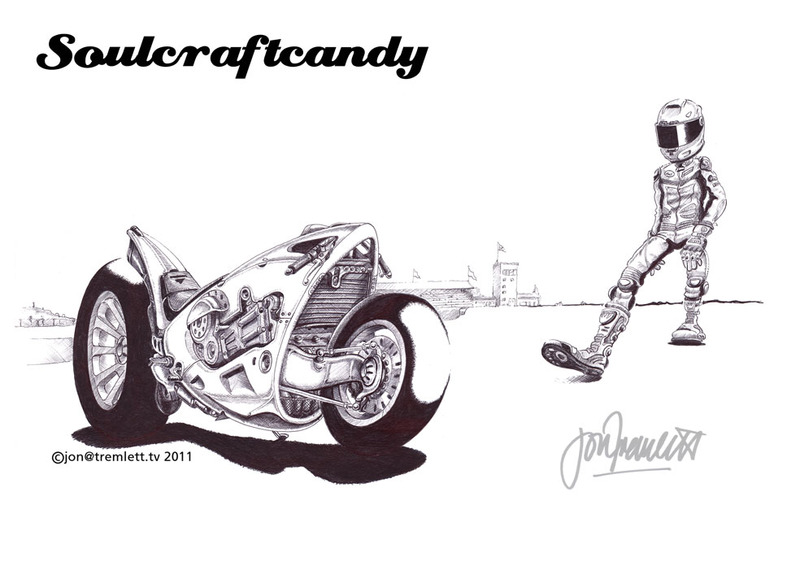 A slight deviation from the well ploughed furrow of motorcycle art today, as one of my other projects reaches its end. Now that the gift has been given, I can let you in on something that I’ve ben working on for the last few sessions. My friends visit the blog and so it is always a good idea not to show stuff too early, they may see things they’re not meant to. This is a gift picture done for a very good friend, Martin, to celebrate his birthday. It’s done on A4 Bristol Board using my favourite current techinique of watercolour wash and drawing pen. 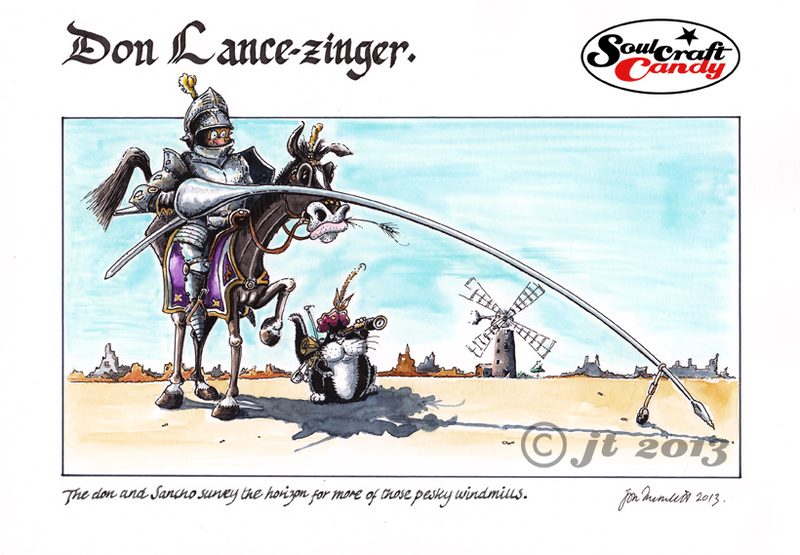 My friend is a strangely quixotic german, and over dinner the other week my partner and I came up with this idea of the dis-functional knight based on the Cervantes character of Don Quixote. Oddly, Martin too has a sidekick called Sancho, his cat. It seemed very fitting at the time. It took more than a couple of goes to get the horse looking silly enough, but I think I succeeded in the end. And turning my hand to a bit of calligraphy, after rushing to the library for a reference book, was an interesting experience, like dipping a toe into an adjacent pool of different colour water. Needless to say Martin loved it, and his wife Adriana knew exactly what the picture was referring to. Selling a picture is a rewarding experience and one always hopes that the buyer will enjoy it for many years to come. One is of course always happy and grateful for their support and custom, and it’s a great feeling knowing that you have made that connection with someone. Giving a picture, or indeed anything that you have created or made, invokes completely different feelings, particularly when it’s a complete surprise to the receiver. I get a real kick out of seeing their faces and feel tremendous gratitude from hearing their appreciation and thanks. I always hope that every time they see it, the picture reminds them not just of me, but of that moment and the friendship that we share. These kinds of gifts are often wholly unique and the investment in time, energy and care in their making says a lot about how much your care about someone and what their friendship means to you. It’s a wonderful thing. 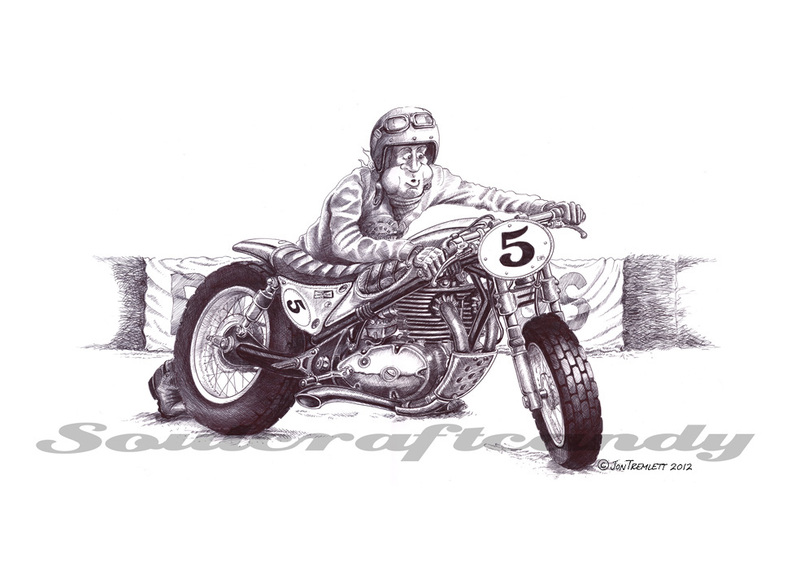 Ok, so this one doesn’t fit into the cafe racer series but, it’s been with me for a while, slowly reaching completion and falling conveniently into the category of “ work needing to be finished. It’s called “Paddock Push”. The inspiration for it came from a few different angles. Throughout the history of bike sport there have always been instances of intrepid individuals wrestling moderately inappropriate machinery around Off Road. Massive BMW’s careering across the Sahara in the Paris Dakar, Harley Davidsons pounding around the Catalina Grand Prix and overweight Brit engined motocrossers ripping up the fields of England. Wherever there are lightweights, one will find the heavyweights somewhere in the background. This is not necessarily a homage to these feats of derring-do, however I am drawn to the thought of the unlikely hero, the underdog. The choice was to create one in full flight and one in a more static situation. The first to be complete is the latter, where the apparent grace and power of a big machine in motion is replaced by the struggle to man-handle the thing around when the engine has finished doing what it does best. If you’ve ever moved a heavy machine around on a loose surface you’ll understand why the guy is huffing and puffing. 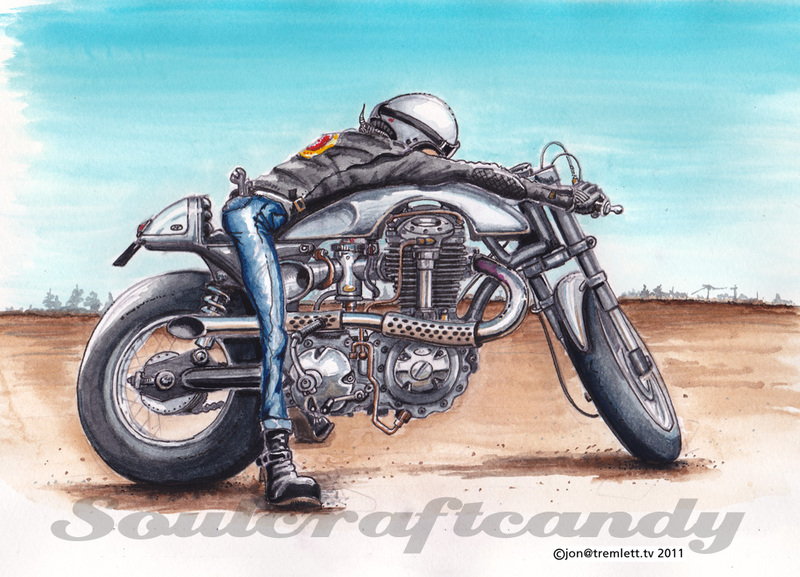 The next cafe racer picture is nearly done. Watch this space. 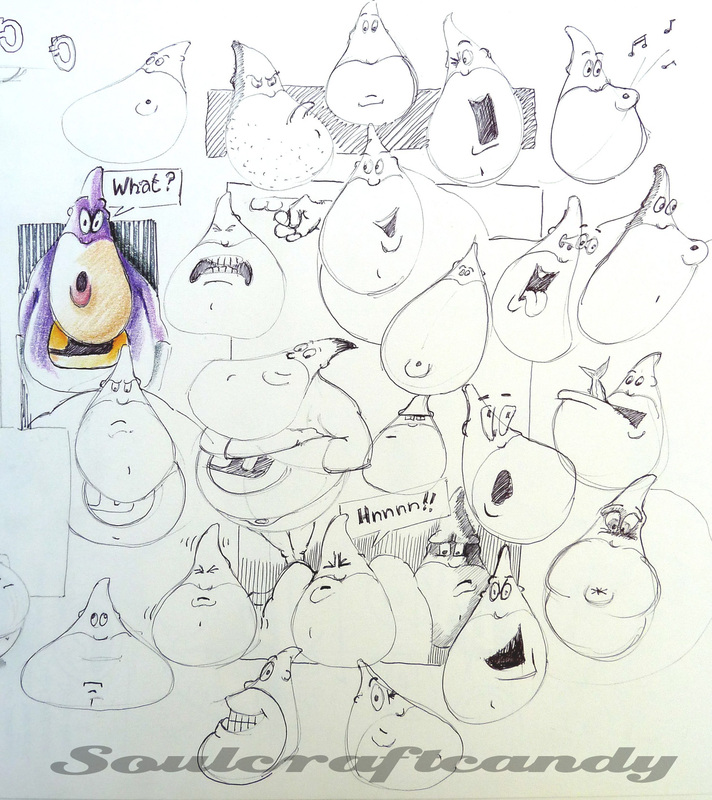 Here’s another slice of the mixed fruit cake of drawing that goes on around here. The picture above shows a guy I have been playing about with for some time, and he’s the closest I’ve ever got to developing a character. He arrived in my life some time ago whilst working on a communications project. 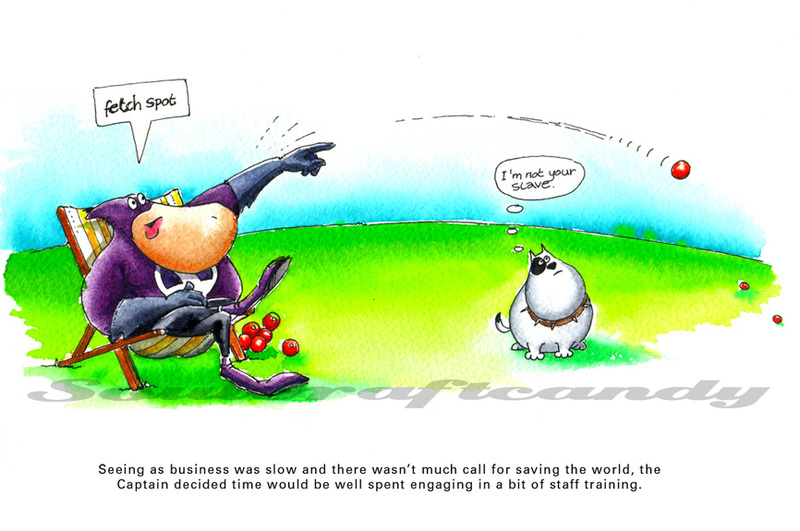 An opportunity had arisen to use a character to promote certain messages the client had in mind. This guy was not a direct result of that exercise but was born during a moments idle sketching one evening. The project had been about communicating expertise and my mind had wandered in the opposite direction to contemplating ineptitude and how to communicate that. The idea of a bungling, idiotic and ineffectual “superhero” type had a strange appeal, someone with all the gear and no idea. Not long after his arrival he was given a name, Captain Shark, after my small design business whose logo he wears on his chest, and for want of anything better at the time. He rapidly went from a slightly muscular bloke to this rather podgy individual graced with abundant enthusiasm, an overly fertile imagination and elevated sense of his own abilities. A sidekick in the form of a small dog appeared soon after and my sketchbook at the time bulged with sketches of him trying to engage with the world in one form or another. And there he has remained for some time now apart from a few select outings like the watercolour above. This has very much to do with not knowing exactly what to do with him. Over the last year or so he has undergone some experimental name changes, I closed my company so the shark reference doesn’t have the same ring to it, and a dormant attempt to turn him into something else, like a mad inventor or suchlike. So he’s very much still a work in progress. What he does have though is staying power as frequent visits are made to that particular sketchbook to move him on a bit further or simply play around with him. Whatever fate awaits him, he is immense fun to sketch and draw. Because his body form consists of a series of rounded blobs he is moderately easy to pose and the tight fitting spandex outfit lends him a kind of elasticity that is fun to exploit. Being a cartoon he is a great vehicle for trying things out, for instance, if I’m stuck on something else like a posture it’s often faster and easier to work it out using his bendy body form first and then develop from there. He is essentially like a bit of 2 dimensional modelling clay and a handy catalyst for getting ideas moving. More about him soon. As mentioned before on the blog there are always things going on in the background while work on the larger finished drawings is progressing. Sometimes this takes the form of working sketches which will form the basis of larger works, at other times they are small drawings that are used to practice techniques or develop an idea. Above are a small group of what are known here as bikeheads. Invariably the larger drawings contain a character or two and it is often a challenge to get them looking right for the given context that they find themselves in. Finding the correct pose and body shape is never simple and the same goes for facial expression, and how this reflects the characters personality. The former are dealt with purely through sketching out varying forms but, the latter is harder, especially when you realise that even the slightest variation in line can change a facial expression completely. So as an aid to get things going I have started a kind of character bank in which to keep all the doodles of heads and faces that appear through the sketch sheets. It will then be easier to have a look through and find some inspiration when it’s needed. Adding some colour to these helps to bring out the character and keeps my colour pencil technique up to scratch too if it’s not being employed elsewhere. Which leads me neatly onto this second group. Back in December a post contained some small groups of varying bike styles I was playing with at a reduced scale. Those had been completed in crayon and ink. These above were done purely to see what would happen if they were done using liquid inks and watercolours. To find out how intense the colours would be and how much of the detail could be held given the very liquid nature of the medium and the coarser paper used. Very fine Rotring pen has been applied too, to firm up[ the outlines and add extra black where desired. The paper was fine for the paints but proved to be a bit too “wooly” for the finer stuff subsequently done with the pen. Next up will be a test on harder paper. Some say you can’t learn to draw from a book. This may be so, or not, but a couple of really useful books I refer to regularly are Action Cartooning by Ben Caldwell, here, and Cartooning The Head & Figure by Jack Hamm, here. Both are invariably out on the desk when character sketching. Neither will teach you a style but, both will inform whatever your personal style may be. Great books. Is it now a painting? Certainly the character of the image is completely different, the starkness of the ink drawing is replaced by a softness afforded by the colour treatment. What’s also interesting is that even though a stronger connection to reality is forged with the addition of colour, it has also brought a stronger emphasis to some of the more comic elements. The purpose of the exercise however was not to set up some kind of competition between the two images, more to explore how colour would effect the final outcome and to get my rusty painting hand back into action. Some details proved easy and enjoyable to do whilst others remained a challenge, so there is still work to do before getting to that point where one is confident in creating what your minds eye can see, on the page in front of you. They say that in order to truly become an expert at something you must practice it for something like ten thousand hours, quite a way to go if expertise is the goal. Thankfully it is not, well not yet anyway, re-learning to play with some colour media is. So there will be more of these. There is an unseen conversation going on in this picture. It is a chat between man and machine. When the original sketches for this picture were posted, my good friend Richard spotted them and sent me a mail. Although my own feelings what might be being said here leant towards the idea that either party could be asking of the other, “let’s see what you’ve got, what you’re made of?”, he likened it to ones acquaintance with a long term friend, and the continuation of a conversation. There is no questioning in his version, just a simple statement, “hello old friend, let’s go out and play”. For me it works both ways and what lies at the core of either is the belief that one forms relationships with objects that you interact with, both on an emotional and physical level. This is true about many objects that we choose to spend time with. Ask any motorcyclist about the bikes they own or have owned and they will fall into one of the following two categories (probably). Firstly there are those that do nothing more than give us access to their basic usefulness, provide transport for us, carry us from A to B. They are handy, but never indispensable. Appreciated but never loved. Used but never improved. The second group are different. They connect with us on an emotional level beyond the practical, we consider their good and bad points in equal measure and make improvements where we can. We clean them out of pride as much as necessity, and we like to show them off. In short we invest time in making them ours. They are often referred to as “keepers”. To some extent it’s the same with the many sketches I produce. Again there are those whose only function seems to be to act as the expression of an idea and nothing more. Their purpose totally fulfilled purely through existence, visual jots to remind you that you had an idea. It would be easy to think that the group that sits alongside these would be those that hit the spot first time, but this would be untrue. They do occasionally appear but it’s rare. Like the bikes that turn into “keepers”, members of this other group connect with us in a different way. We see in them the potential of an idea that is yet to be fully formed. With a bit of time and effort thrown at it you know what’s lurking in there can be brought to the surface. It might mean totally redrawing it, many times over in some cases, or it may require nothing more than the addition or relocation of a few lines. The more you can see the potential emerge the more you’re inspired to tease more of it out. Before you realise it you’ve got another “keeper”, ready to work up to a finished image. Have you ever wondered why so many of us scribblers keep so many piles of apparently jumbled and crumpled sketch sheets? Although I spend a great deal of time and energy sketching out fresh ideas, a good deal of time is also spent revisiting many older ones too. Spreading them out across the floor and having another look for that spark always throws up something new that perhaps you didn’t see before. Finding these “sleepers” and working to turn them into “keepers” is one of the great pleasures in making these drawings. It provides a big chunk of the creative reward and always reminds me that it’s not always about the end goal, but the journey one took to reach it.